This shows the contraption with which I demonstrated a 3D viewing technique in a lunchtalk at ICL Bracknell many many years ago. Also the notice for the meeting, produced before people lazily started using anonymous machine fonts. The frame held a Heathkit television which I also made, but which is alas no longer with us so I can't show how everything went together. Two potentiometers were fitted to the end. The tilt and the base rotation was measured by rubber bands round pulleys on the frame and base axis which can be seen in the photo. The potentiometers and bands aren't mounted. The tilt and rotation were measured by the A/D port of s BBC micro which displayed a picture on the screen of the television. The user tilts the screen or turns the frame around to view the image from different angles. For the talk the picture shown was of an L-shaped bungalow. The actual talk was about a number of other techniques and this model provided something for them to come around and look at afterwards. It was quite amusing seeing how many people tilted the screen down so they could look upwards through the floor of the bungalow. The base is a roller bearing with sleeve end pieces as the rollers. The sides are supported by the large circular plates running on small pulleys, the axle is simply to provide the measurement of the tilt angle and hold the frame in position, it isn't load bearing. 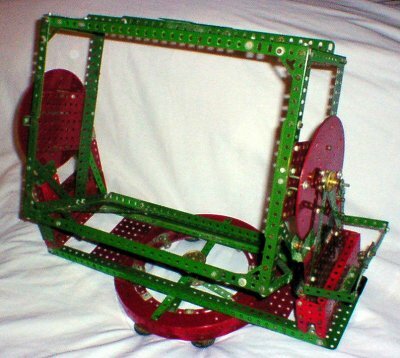 Other more straightforward Meccano models can be seen here.